Stocks broke out of a narrow range on Friday following news that two major banks grew their bottom line in the first quarter. 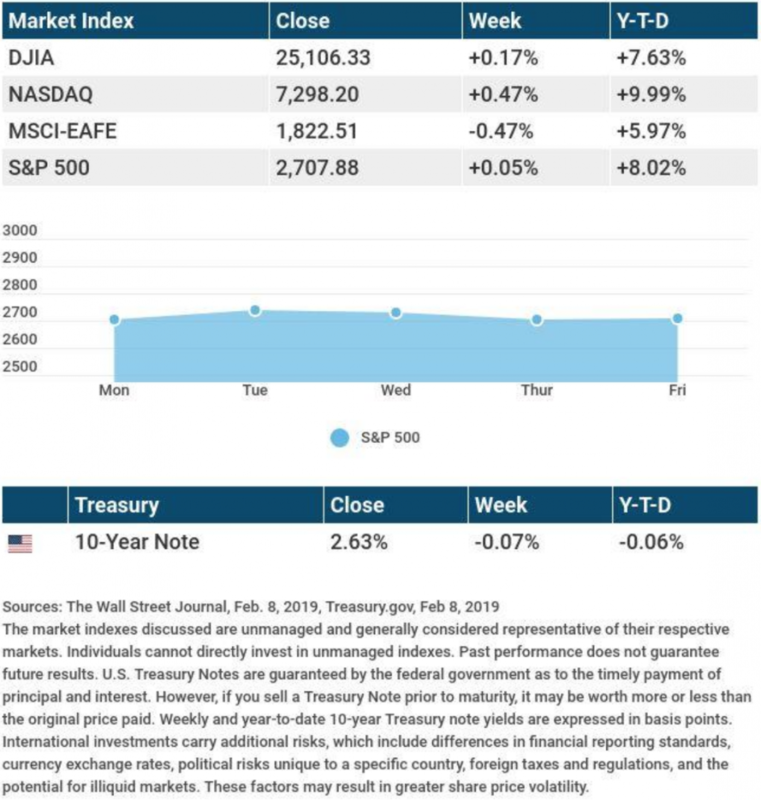 For the week, the S&P 500 rose 0.79%; the Nasdaq Composite, 0.91%. The Dow Jones Industrial Average improved 0.50%. Turning to overseas stocks, the MSCI EAFE index declined 0.09%. The market spent much of the week in a lull as investors waited for earnings season to begin. Wall Street is paying close attention to both guidance and profit margins. Friday, Wells Fargo and JPMorgan Chase both reported Q1 profit growth, and JPMorgan Chase announced record revenue. This was welcome news. Analysts have tempered some of their expectations entering this earnings season, recognizing that slowing global growth, tariffs, and dollar strength may be affecting corporate profits. The dollar rallied 6.2% in Q1. The Consumer Price Index rose 0.4% in March, the most in 14 months. This matched the consensus forecast of economists polled by MarketWatch, who believed rising gas prices would affect the number. Even with this March jump, annual inflation remained relatively tame at 1.9%. Note that U.S. stock and bond markets will be closed on Good Friday (April 19). Friday: March housing starts and building permits. Stocks just posted their second straight weekly gain. Investors were encouraged by the latest jobs report and new signs of progress on a U.S.-China trade deal. The Dow Jones Industrial Average advanced 1.17% in five trading days; the S&P 500, 1.27%; the Nasdaq Composite, 1.72%. The MSCI EAFE index of international stocks improved 1.84%. The economy generated 196,000 net new jobs in March, according to the Department of Labor. Monthly job growth averaged 180,000 in the first quarter. Both President Trump and Chinese Vice Premier Liu He told the media last week that the U.S. and China were getting closer to a new trade accord. Meanwhile, a week into the second quarter, another earnings season is about to unfold. As we await results, we will take a brief look back at what happened in the first quarter. Stocks staged an impressive comeback in Q1, recovering nearly all of the losses incurred in the last three months of 2018. Investors were able to set some of their recent concerns aside, at least temporarily. The Federal Reserve indicated that it would pause interest rate hikes, and while no U.S.-China trade deal was completed during the quarter, the ongoing trade dispute cooled. The economy seemed healthy: the jobless rate was under 4%, hourly pay was rising at more than 3% a year, and inflation was tame. Add in some upside from corporate earnings, and a recipe for gains emerged. The Dow rose 11.15%; the S&P 500, 13.07%; the Nasdaq Composite, 16.49%. Additionally, this was the best first quarter seen on Wall Street since 1998. In March, the Federal Reserve left the benchmark interest rate alone and indicated that it would not make a rate hike this year. As recently as December, the Fed had forecast two hikes for 2019. The first-quarter earnings season kicks off this week with three big banks reporting results. The question is whether stocks in the S&P 500 will post earnings that beat analyst expectations to the degree they have in the past few quarters. Other questions: how will consumer confidence, wage growth, and job creation fare in Q2? Will there be a Brexit or a new U.S.-China trade pact this quarter, and if so, how will global markets react? If you have questions of your own as this quarter unfolds, remember that we are always here to talk. Wednesday: Minutes from the March Federal Reserve meeting, plus the latest Consumer Price Index, tracking monthly and yearly inflation. Friday: The initial University of Michigan consumer sentiment index for April, which assesses consumer confidence. As in February, investors spent most of the first full trading week of March hoping for new details in U.S.-China trade negotiations. While they waited, stock benchmarks drifted downward. 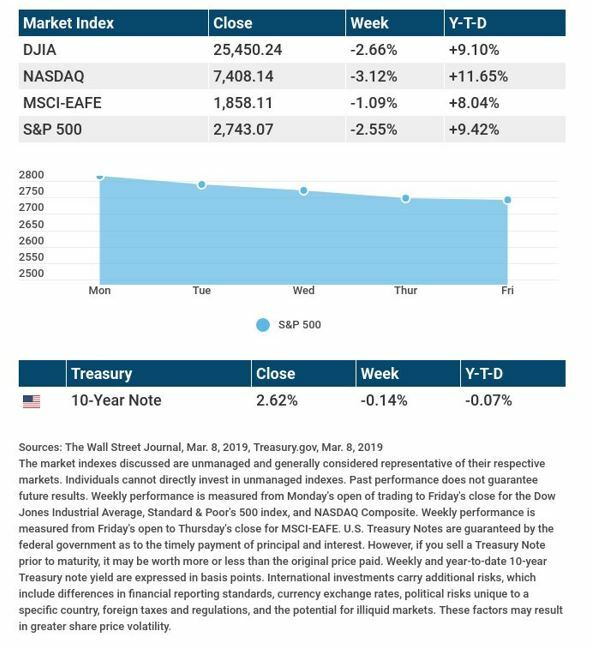 From Monday’s open to Friday’s close, the S&P 500 lost 2.55%, while the Dow Industrials took a 2.66% fall, and the Nasdaq Composite weakened 3.12%. The MSCI EAFE index tracking developed markets outside the U.S. and Canada fell 1.09%. Why did stocks lose momentum? In a hint that global economic growth might be slowing, the European Central Bank abruptly reduced its 2019 Gross Domestic Product forecast for the eurozone from 1.7% to 1.1%. A disappointing reading on U.S. hiring also raised questions. According to the Department of Labor, the economy generated only 20,000 net new jobs in February. This was the smallest monthly gain since September 2017. Nevertheless, the unemployment rate fell to 3.8%, while underemployment declined sharply to 7.3%. (These decreases could reflect furloughed federal employees returning to work.) The average wage rose 3.4% in 12 months, the largest year-over-year increase in a decade. Harsh winter weather may have impeded hiring last month, and February’s payroll growth could be revised in the Department of Labor’s next report. The fourth-quarter reporting season is all but over. FactSet notes that the S&P 500 has seen earnings growth of 13.4% in Q4, marking the fifth straight quarter with a double-digit rise. Stocks lost ground last week, breaking a long string of weekly advances. The extended rally partly reflected optimism that the U.S.-China trade dispute would soon be resolved, but a deal may or may not happen. The week offered a reminder that Wall Street sees both ups and downs. Day-to-day market fluctuations should not cause you to alter your long-term approach. Tuesday: The Consumer Price Index, tracking monthly and yearly inflation. Thursday: January new home sales and February retail sales. Friday: The University of Michigan’s initial March consumer sentiment index, measuring consumer confidence. Stocks rallied last week as optimism about a potential U.S.-China trade deal grew. 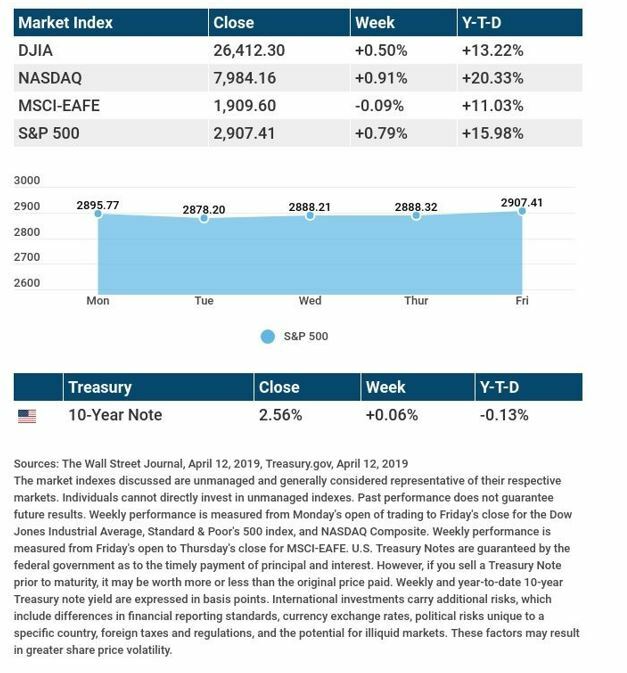 The S&P 500 advanced 0.80% during the 4-day trading week to 2,792.67. The Nasdaq Composite improved 0.86% to 7,527.54, and the Dow Jones Industrial Average gained 0.64% to 26,031.81. The renewed prospects for a trade pact were not the only development investors found appealing last week. There were indications that the Federal Reserve might be a bit less committed to its plans to raise interest rates further this year. There were no surprises from the Federal Reserve’s Board of Governors, who released the transcript from their January meeting on Tuesday. Investors pore over the meeting minutes looking for clues about the Fed’s next move on short-term interest rates. Fed policymakers appeared split on what’s next. Some felt another rate hike was needed to help slow the strong economy, while others favored a “wait-and-see” approach. In January, existing home sales were at their slowest pace since November 2015, and down 8.5% year-over-year. One factor: rising home values. Last month, the median single-family home sale price was $247,500, almost $7,000 higher than a year ago. Mortgage rates have now fallen for three consecutive weeks, a development that may influence home buying decisions in coming months. Thursday, a Freddie Mac survey found the average interest rate on a 30-year, fixed-rate loan at just 4.35%. Tuesday: Fed chair Jerome Powell begins two days of testimony on monetary policy in the Senate. Wednesday: The National Association of Realtors releases its latest pending home sales index. Thursday: The federal government provides its first estimate of fourth-quarter economic growth. 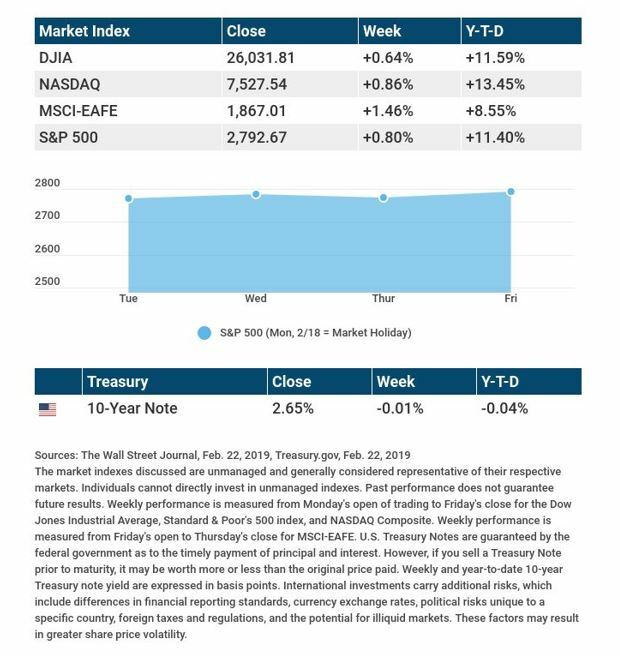 Major U.S. stock benchmarks eked out slight gains last week, with corporate profit reports and news about U.S.-China trade negotiations vying for investor attention over five trading sessions. The big three ended the week little changed from where they settled the previous Friday. The Dow Jones Industrials rose 0.17% percent, while the S&P 500 Index gained 0.05% percent. The NASDAQ Composite ended the week up 0.47%. Looking at international stocks, the MSCI EAFE index retreated 0.47%. As of last Friday, 66% of all S&P 500 companies had reported fourth-quarter earnings. So far, 71% of these firms have announced earnings exceeding estimates, and 62% have seen revenues top projections. Halfway through earnings season, 2019 future guidance has been a mixed bag for S&P 500 companies. For Wall Street, future earnings can be just as important as current earnings. We keep a close eye on both. March 1 is the 90-day deadline set by President Trump for a trade deal with China. If no agreement is reached, the U.S. may consider a new round of tariffs. 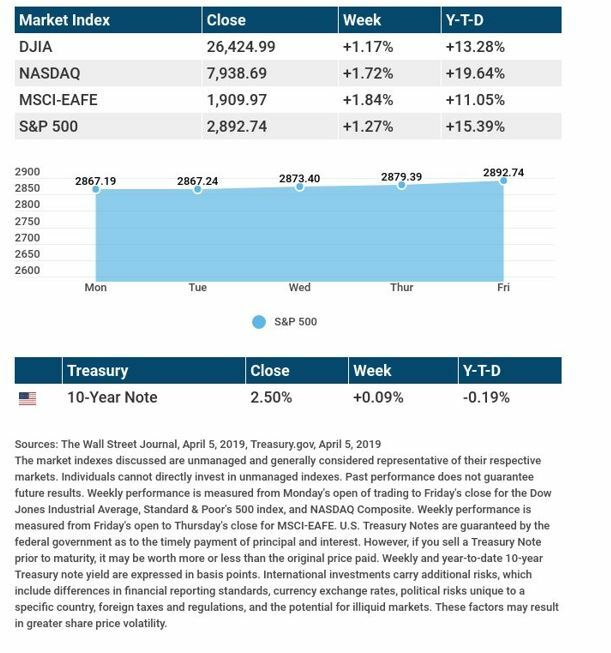 On Thursday, news that President Trump and Chinese President Xi may not meet before the March 1 deadline added to the market volatility. The decision by the U.S. on new tariffs may hinge on how much progress has been made toward a new agreement. We don’t expect that to become clear until the deadline nears. Many indicators help economists take the pulse of the overall economy. The Institute for Supply Management keeps a critical, but not widely followed, index, which helps gauge the health of the service sector. The January reading on this index came in at 56.7. Any reading above 50 shows that the service industry is seeing solid growth. Over the next several weeks, we’re expecting more volatility as the markets digest economic news, a new wave of corporate earnings, and twists and turns on the geopolitical front. We will be watching to see if anything changes our short-term and long-term view. If you have any questions, don’t hesitate to contact us. Wednesday: January’s Consumer Price Index, which measures monthly and yearly inflation. Thursday: December retail sales figures (a delayed release due to the government shutdown). Friday: January’s preliminary University of Michigan consumer sentiment index, a gauge of consumer confidence levels. The content is developed from sources believed to be providing accurate information. The forecasts or forward-looking statements are based on assumptions and may not materialize. The forecasts also are subject to revision. The release of data may be delayed without notice for a variety of reasons, including the shutdown of the government agency or change at the private institution that handles the material. Companies mentioned are for informational purposes only. It should not be considered a solicitation for the purchase or sale of the securities. Any investment should be consistent with your objectives, time frame and risk tolerance. The return and principal value of investments will fluctuate as market conditions change. When sold, investments may be worth more or less than their original cost. Companies may reschedule when they report earnings without notice. Subscribe to receive news and updates from us.